My PSP has been lying unused in a drawer for months now and even my Wii has gotten very few hours of playtime lately. I'm even bored of all this constant talk about the iPhone having the better games. Care to take a guess why this is the case? I've been so busy in the last couple of months that I haven't had the luxury of sitting back and playing games in a really long time. If I happen to have a couple of minutes to kill, I now turn to my Android phone. It doesn't bother me that iPhone supposedly has the "sweeter" graphics as long as there are games like Replica Island around. If you believe graphics aren't everything and are also a Super Mario fan, you should definitely read through this test report. Replica Island is a retro-style game. Following in the footsteps of Super Mario & Co, this game has that special old-school feel that makes playing so irresistibly fun. You're in control of a little green robot (should be a familiar face to all of you by now) who needs to collect three red diamonds in order to complete every single one of the 40 different levels. On the ground and in the air, you are forced to take on enemies or try to get around them to reach your precious diamonds. Coins collected along the way can provide you with a temporary defense shield, allowing you to mow down any enemies in your path. Although the game’s main structure is simple and repetitive, the levels are so varied that you’ll never get bored. The game also has an adventure-style background story having to do with a professor, a mysterious artifact, and a creepy island. At the beginning of the game, you get a taste of the story through a dialog with the professor and some of the other characters. If you didn’t enjoy Super Mario World, you won’t care for Replica Island. Only those with old-school games in their blood system will appreciate Replica Island and spend hours on end playing it on their phone. A short tutorial introduces you to the controls at the beginning of the game. Depending on your device, you can control your little Android robot with the trackball, the D-pad, or using your built-in tilt controls. You can switch on “Tilt Controls in your options in the start menu. This type of controls is marked as experimental, but I found it to work much than the d-pad on the Milestone. Two buttons are located on the left side of your screen. With the larger blue button, you propel your Android robot through the air, which is where he spends most of his time throughout the game. When you hold down this button, you’ll see your energy bar diminish quickly at the top left of your screen. Thankfully, your energy recharges in the bat of an eye. 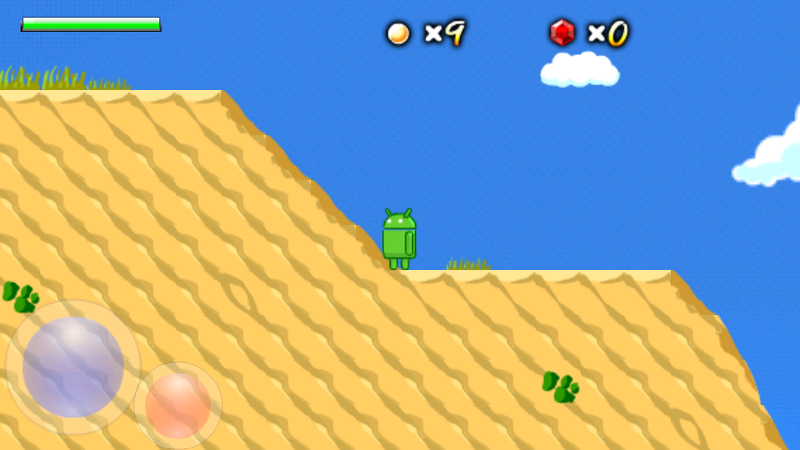 As soon as your green robot is in the air, you can control him while he floats around in the air for a while. There’s no need to keep your finger constantly on the blue button as he flies around. Use the smaller red (attack) button to kill and annihilate your enemies. Pressing the red button while you’re in the air plumps you right on top of your enemies thereby destroying them. Holding down the same button creates an energy ball that you can direct towards your foes. When it comes in contact with an enemy, you take over the controls of the particular enemy. Once you’re in control of an “enemy combatant”, you can destroy the poor little guy with an explosion. Sometimes you may find it necessary to direct your captured enemy towards a wall in order to destroy him along with it. 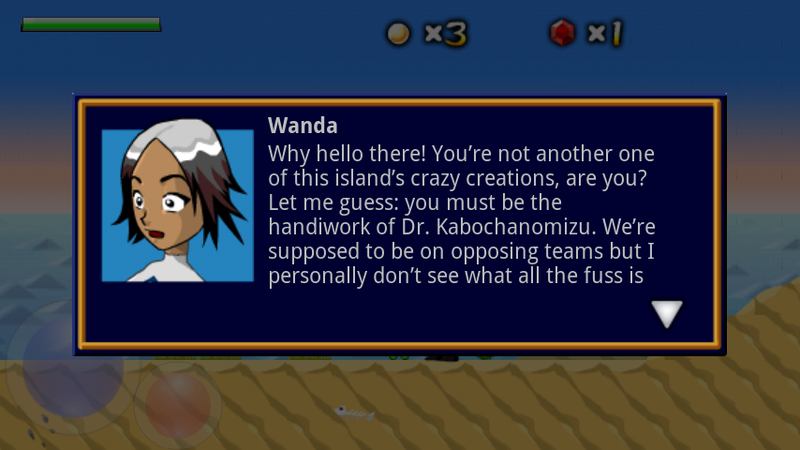 As mentioned previously, you’ve got to be into this type of game to have a lot of fun with Replica Island. As far as screen & controls are concerned, I really liked the fact that you could select between several different control options. Replica Island can be played with ease on every type of device since all of the different control modes work exceptionally well. Among these, I found the D-Pad seemed to be the least efficient, whereas I noticed no significant different between using the trackball and tilt controls. Both seemed to work just fine. Replica Island ran perfectly during our test without the slightest lag or glitch. 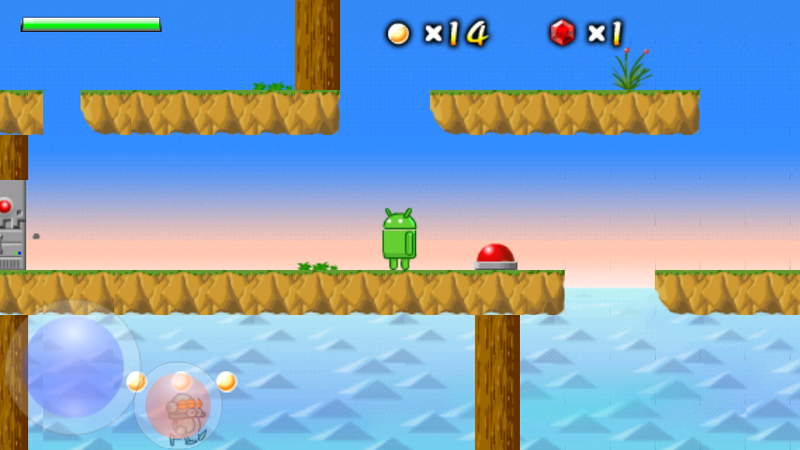 Replica Island can be downloaded for free from the Android Market.